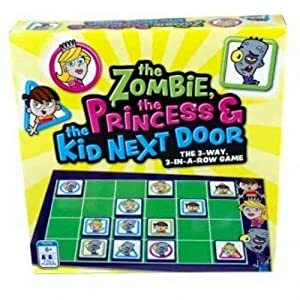 The Zombie The Princess And The Kid Next Door. It's the 3-way 3-in-a- row game. On your turn place a tile on any open space on the game board. Try to get three in a row of same character same color boarder or same boarder shape. When all the spaces are filled the play with the most tokens wins.